It may seem like I’m a BCL groupie, because of all the coverage I give them. The fact is, they do good things in a city that needs more good things happening. They continue to push boundaries when it comes to public art projects, and they won’t rest until the city’s self-perspective changes for the better. For the remainder of this month, and continuing in July, BCL is staging their latest project, Storefront Residencies for Social Innovation. When I first heard about this project, I thought it was just a rumour. I said to myself, “There’s no way they can offer local artists storefront gallery space for FREE.” Well, they’ve done just that. 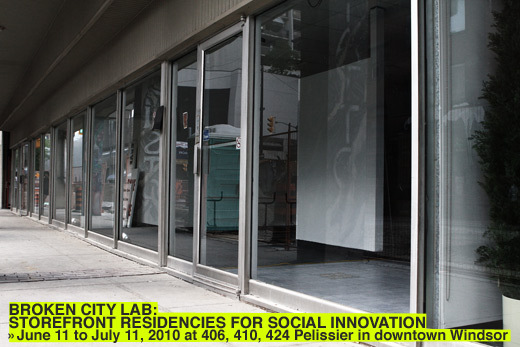 The Storefront Residencies for Social Innovation project began last Friday, with the BCL crew cleaning and fixing up three storefronts along Pelissier Street- units 406, 410 and 424. Despite the construction, the group is forging ahead, and they hope to get as many Windsorites visiting as possible. The more people who see the potential of these vacant stores, and the potential of this collection of people willing to work at improving the city’s image, the better for all of us. They’ve got 25 media artists, actors, videographers, cooks, bakers, gardeners, and storytellers scheduled to appear (even labeling the participants as such seems inadequate, they’re all innovators). The participants come from all across Ontario, as well as Montreal, Vancouver, and Detroit. They’ll be offering free food programs like The Breakroom (a profit-free cafe and lunch) and Portraits, Pies and Peace (Sunday afternoon discussions, and sharing of homemade pie, plus some drawing and painting). Communication-based projects like The Peoples Museum & Fabulations de Windsor (bilingual community-based story telling and story gathering) and Talk To Strangers (a text-based outdoor window installation) will satisfy the word-smith in all of us. And for those with a keen sense for textiles, The Sweater Factory (a process-based performance involving the unraveling and re-assembly of sweaters) and the Swap Shop (a clothing swap of used, good-condition items) will keep you coming back to see what’s new. There’s something for everyone. And even if you’re not a fan of performance art or pie, the chance to see this project come to fruition shouldn’t be missed. This is social change in action. And really, who doesn’t like pie? June 25 – July 11 How To Make a Documentary: Live documentation of the residency in its entirety/video editing workshops. The Breakroom: A Profit-Free Cafe and Lunch. Creation of an interior urban green park. A series of actions and tactics challenging Windsor-specific Non-Places. (Guelph, ON) June 11 – 23 The Peoples Museum & Fabulations de Windsor: Bilingual community-based story telling and story gathering. (Vancouver, BC) June 11 – July 8 Norman Eberstein: An interactive, live performance involving surveillance cameras and a security guard at work. (Montreal, QC) June 13 – 19 Swap Shop. (Windsor, ON) June 14 – 25 The Sweater Factory: process-based performance involving the unraveling and re-assembly of sweaters. (Toronto, ON) June 15 – July 11 Storefront Success Stories: Based on admiration for the local shopkeeper, the project aims to create new connections, knowledge, and theories between Windsor’s different businesses, people, and sites of productivity. Kero (Windsor, ON / Detroit, MI) June 17 – 20 An interactive motion-sensored installation engaging outside pedestrians and interior viewers. A visual exchange between Kitchener-Waterloo and Windsor: a ride down the highway dialog through photographic and sound experience. June 30, 7pm (opening) Community-shaped, Interactive Interior garden space. Multimedia installation using process-based research of the Detroit-Windsor bridge and tunnel which cross the Detroit River. Storefront projection installation using Google Street View stills of Windsor. (Toronto, ON) June 25 – 27 Talk To Strangers: a text-based outdoor window installation. (Windsor, ON) June 27, 28, July 4, 5 (workshops), July 7-8 (show) IMAGINATION LAB: walk-in art workshops for kids accompanied by their caregivers. (Windsor, ON) June 28 – 29 Portraits, Pies and Peace: Sunday afternoon discussions, and sharing of homemade pie, plus some drawing and painting. (Windsor, ON) June 28 – July 1 Interactive Light Board Window Installation. Donation-based in-store training to improve gambling skills – geared towards subverting the economy in Windsor. (Toronto, ON) June 30 – July 2 Pro-Click Factory: digital, interactive open-mic nights. An evening lecture and their techniques for cultivating the best YouTube videos. Bell Payphone Labs: PL1999 and GMBLL. Payphone intervention workshops. The Amalgamated City of W: Imagined merging of Windsor and Waterloo through campaign office meetings, consultations and presentations. Border Bookmobile: A reading station. Multiple public Interventions based on analysis of debt-accumulation, poverty, city-beautification, and community engagement.